Or in this particular case, know when to fix it, know when to nix it. I have a pretty tenacious “never say die” attitude and, thanks to my proud Scottish heritage, a fairly benevolent Level of Broken-ness Scale that I refer to when confronted with holey clothing, damaged tools and faulty electronics. The scale, a flow chart, really, guides me when to say goodbye to broken-down stuff. It consists of a variety of questions that help me decide whether it’s time for mending (putting some kind of band-aid on the issue) or spending (calling time of death and shelling out for a new replacement item). Clothing: Can I mend it? How long will it take me to mend it? Do I want to mend it? Tools: Is the damage cosmetic or functional? Can I keep using it without it having a detrimental affect on my work? Electronics: Are there workarounds to the issue? Does the equipment still do anything useful at all? It’s a good system – I manage to save a bunch of money and put off adding to the landfill as long as possible. There are times, however, when this process goes awry and I cling to something far longer than is reasonable. Eight months ago my laser printer began behaving belligerently. It decided to pull attitude and occasionally not communicate with my laptop. I re-installed the printer driver and it still only worked half the time. Not to be defeated, I discovered that I could bypass the glitch by unplugging and re-plugging the USB cord each time I wanted to print. Months went by and the printer was starting to need a lot of hand-holding but I soldiered on, finding new work-arounds each time it became temperamental. Taking in too many pages and getting jammed? I sat and monitored page intake, adjusting the paper feed stack page by page. Print quality failing? I took out the toner cartridge and gave it the old college shake. Page feed not working? I gingerly coaxed the pages into the feed. Printing a simple document had morphed into me performing a series of movements that resembled a strange mating dance in order to get the printer to put out at all. Why didn’t I replace it? Because the final question in the series of questions on the Level of Broken-ness Scale, Does it still do anything useful at all?, could be answered with a “yes” (most times). My breaking point was finding myself squatting in front of the printer, peering in, verbally pleading as the printer feebly tried to gain purchase on a page and then stopped trying. My petulant printer experience got me waxing philosophically, how many other things did I have a death-grip on? Saving money and repurposing is fabulous, but sometimes the question, “does it still do anything at all?” is not enough of a reason to keep something (or for that matter, enough of a reason to keep doing something). The end of the year seems to me to be a great time for a body to do a quick inventory of all their resources and check in to see if they are clinging onto things that might need to be physically or psychically released. If you haven’t given yourself a gift yet, maybe this could be it. Happy Holidays, my friends. I’ll be back here mid-January. Remember, if you find yourself doing any crazy mating dances to make something work, it’s definitely time to stop clinging and let go. « Can It Be Wrong If It Feels So Write? My, my, that is extreme! 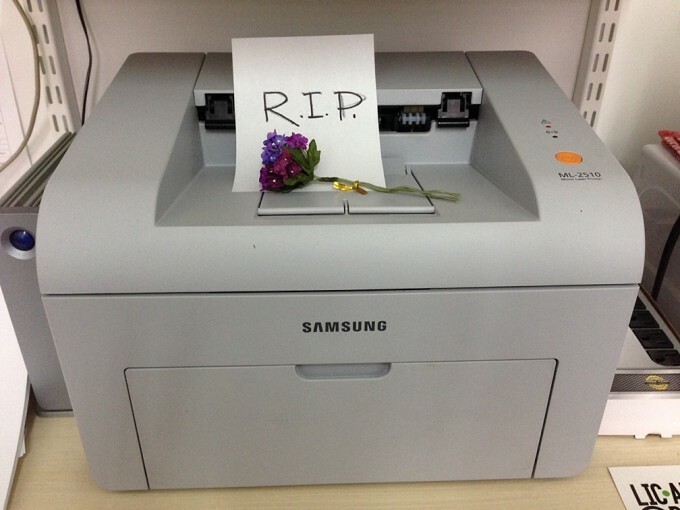 I could never do that to my printer. It would be like beating the elderly – very bad form.